The Brooding Architect has been ridiculously busy at work over the past few weeks, with lots of weekends and late nights. However, unlike many law firms (you all know the main offenders), architectural practices expect you to have a life and as such don’t have ‘after hours meals policies’. My solution was to make The Brooding Architect a ‘packed dinner’ each day, which consisted of the leftovers from the night before, plus a little dessert for the much needed sugar hit to get him through those late nights. 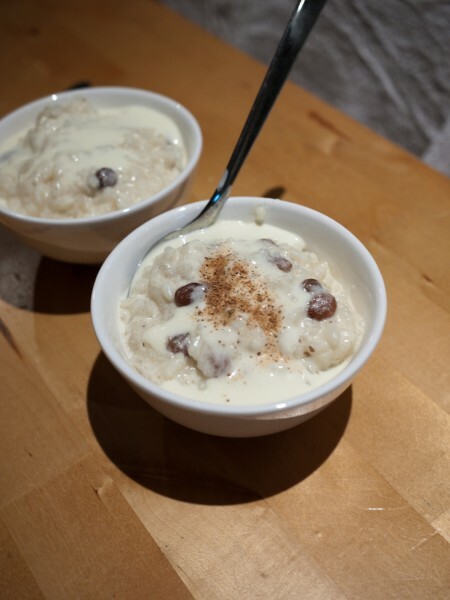 One day I packed a serve of the ultimate ‘pantry dessert’ – Rice Pudding – referred to as such because it is a ridiculously simple dessert, which can be made with ingredients which most people have lying about in the back of their pantry. I was shocked to discover than my Rice Pudding was a quite a hit with a number of The Brooding Architect’s colleagues, who have asked me to share my recipe. To enhance the flavour of this very simple dessert, I strongly recommend using full cream milk, which will result in an extra creamy pudding consistency; as well as fresh ground nutmeg for a lovely spicy hit. Place the the rice, milk, sugar, sultanas, vanilla essence and ground nutmeg and cinnamon quill (if using) into a large saucepan. Bring to the boil over high heat. Once the milk has come to the boil, reduce heat to the lowest possible setting, add the chopped pear and simmer until the mixture is thick and the rice is tender (around 40 minutes). Stir the mixture every 15 minutes or so, to prevent the mixture sticking to the base of the saucepan. Add a dash more milk if the mixture becomes too dry and starts to stick. Once the rice is tender, remove the cinnamon quill and serve warm. If feeling decadent, drizzle extra thickened cream on top. The pudding reheats well in microwave, or if preferred, can be served cold. Fantastic recipe, will be re-testing this very soon! P.S. Just incase anyone is not already aware, you can buy ‘real milk’ which goes down rather well in a recipe like this one – try your local whole foods store !